Last month, my husband and I took a quick trip over the the UK to visit friends and family and take in some beautiful scenery in the English Lake District. This is a particular stunning part of the United Kingdom and attracts millions of tourists from around the world every year. 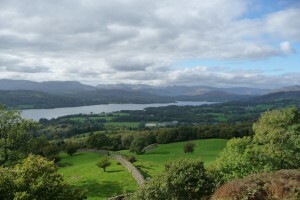 One day we took a trip to one of the most popular Lake District towns, Windermere. It was absolutely packed with people wandering the quaint streets, sitting outside cafes having tea and cakes, or going in and out of one of the many pubs. The pavements are pretty narrow, so we had to shimmy past people on our way to our destination – a short 20 minute walk up hill that was billed as one of the most beautiful views in the country. Upon seeing the vista, one tourist was inspired to spend the rest of his life hiking the Lake District, documenting his walks in books that have become national treasures. Given the fame of the walk and the relatively short distance, we expected it to be a busy trail. But no. We saw only one person on our ascent and found a couple more when we reached the top. I’ve seen this before at busy tourist spots like the Grand Canyon. Walk half a mile from the parking lot, and you can be completely alone. Which just goes to show that people are lazy the world over! Don’t get me wrong – that climb was tough for someone as out of shape as me. I can quite see why most people chose to stay in the village eating scones with whipped cream. But the effort we put into our walk was more than worth it when we reached the top – and it was made all the more enjoyable because it was so quiet. And that made me think about the way most people look for a job. They’re like the people in Windermere, all doing the same things, the easy things, the things that don’t take much effort. Why struggle up that steep hill when you can just take it easy in the pub? And why work on building a reputation as an industry expert online when you can just post your resume to job boards and then wait for the phone to ring? The answer is obvious of course – the effort you put in pays back ten-fold. While everyone else is doing the same lazy things, you can be setting yourself apart with creative search strategies. In the end, you’ll find a job so much quicker if you eschew what everyone else is doing, put your walking shoes on, and get up that hill!